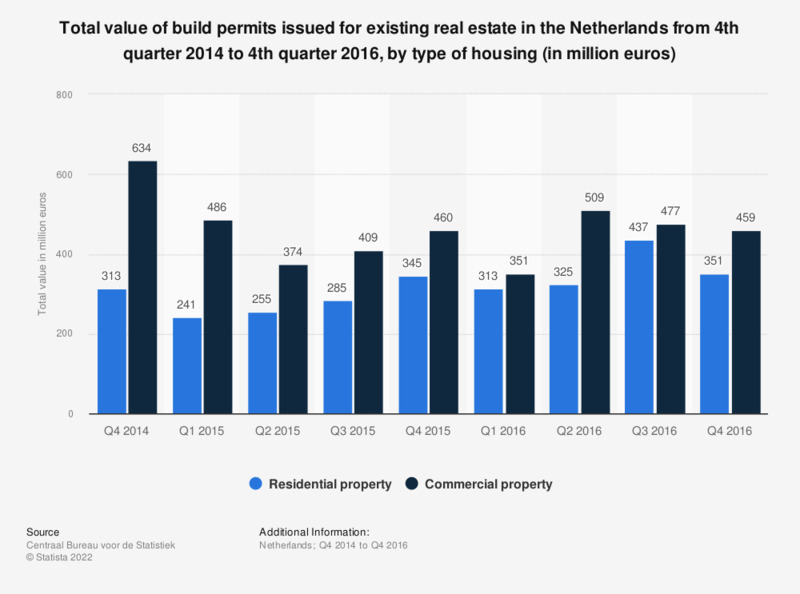 This statistic shows the total value of build permits issued for existing real estate in the Netherlands from the fourth quarter of 2014 to the fourth quarter of 2016, by type of housing (in million euros). In the fourth quarter of 2014, permits issued for residential property were worth 313 million euros. The source states, the building permits issued are not issued for the contruction of new real estate. Instead, they are issued for activities such as renovation, reconstruction and expansion. The number of permits do not represent the number of real estate constructed, as one permit can be issued for multiple residential or commercial buildings. The source notes, residential property includes combinations of residential real estate with a commerical purpose, if the majority of the building value is intended for living purposes. Moreover, the source says, commercial property includes combinations of commercial real estate with residential buildings, if the majority of the building value has a commercial purpose. Everything On "Real estate construction in the Netherlands" in One Document: Edited and Divided into Handy Chapters. Including Detailed References. Statistics on "Real estate construction in the Netherlands"